Hanoi (VNA) - The Yonex-Sunrise Vietnam Open 2016, commencing next week, might be the last international event in which national number one badminton player Nguyen Tien Minh will play on the home ground. 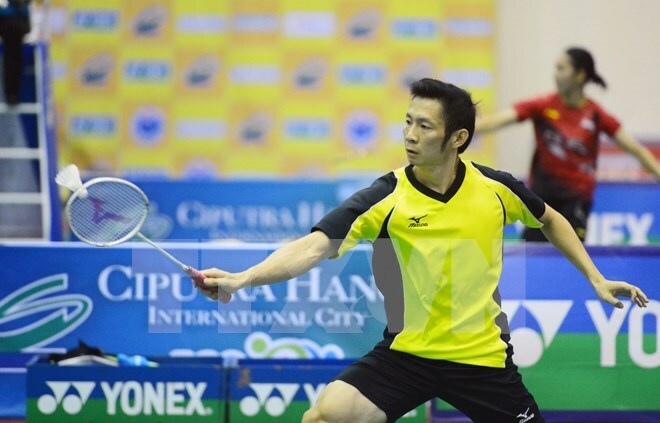 “(Nguyen Tien) Minh is 33 years old and it might be his last Vietnam Open,” HCM City Badminton Federation’s deputy president Huynh Ngoc Lien said at a press conference on July 12. “Minh is not at his peak now. He recently withdrew from the Canada Open and the US Open to maintain perfect strength for the Brazil Olympics. However, he will do his best at the coming Open in his home town,” Lien, who has accompanied Minh for more than a decade, said. Minh, who is seeded sixth here, gained fame from the Vietnam Open, which saw him climb the podium four times in 2008, 2009, 2011 and 2012. As a warm-up to the Rio Games, the HCM City competition has lured about 300 players, including several high-ranking ones, such as Hu Yun (ranked 12th in the world, from Hong Kong), world No 13 Ng Ka Long (from Hong Kong) and No 48 Vladimir Malkov (from Russia) in the men’s singles event, and No 32 Hsu Ya Ching (from Chinese Taipei), No 33 Yip Pui Yin (from Hong Kong), No 52 Natalia Perminova (from Russia), and No 61 Nanna Vainio (from Finland) in the women’s side. Hu and Hsu are top title contenders in their categories. Minh and Vu Thi Trang, ranked 32nd and 39th in the world in the men’s and women’s categories, respectively, are the two strongest players from the host country. Minh will face Siril Verman of India in the first match, while Trang, seeded fourth here, will play Cheng Chi Ya of Chinese Taipei. Vietnam will also send players to the doubles events. Among them, mixed pair Do Tuan Duc and Pham Nhu Thao are expected to have good result after they achieved a surprise win at the Canada Open two weeks ago. The Open will be held at the city’s Nguyen Du Gymnasium from July 18 to 24.